Outdoorsy template for free download on Blogger Templates. This template is fully compatible with any of these web hosting companies. hi, i would like to find out what file can i use to open the xml file? i cant seem to see the html code. You can try to open it in Notepad. It is written in XML and not HTML as Blogger now uses XML. 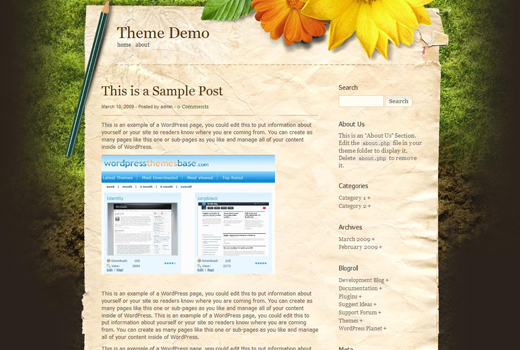 could you help me please ti install this theme on my blog on wordpress.com? I can’t do it by myself that’s why please give me a little help. I am afraid this template is only made for blogger blogs, not wordpress. Hi there! I opened a new blogger blog and it requires a html code. It can not read the xml. The message i get is “XML: Content is not allowed in prolog”. First when you download it from here, you have to use either winrar or 7zip to unzip the folder first before you can find the Outdoorsy.xml file inside. Today it seems that it isn’t displayed as it should be – I can only see a blackish background. What causes this and what should I do to remedy this.? You see where it says “Theme Demo” and Home and About under it? I can’t change or access those links after I updated the XML file of that template onto my blogger. What should I do? Links in main header do not work. Ex “home” and “edit” = useless. Also it always says “Outdoorsy – Demo” at the very top of your blog. Can’t have that now can we? You need to change your Blog title to what you want. The Blog Demo there is the title of the blog, it should reflect the title of your own blog. I have the same problem with Meshell mentioned above. I really love this template, so please help me out!!! Edit button doesnt work on wordpress converted templates. For the blog title, go to Layout -> Edit HTML and do a CTRL + F search for and you will be able to change it from there. The blog title is still ‘Demo – Outdoorsy’ and the title I want to use is in ‘add a gadget’ area and doesn’ move at all. You go see my blog and will know what I’m talking about. My blog title (To fill my lilttle world) is on the upper right side of the page!!! Please, ignore my earlier complains. Thank you for this lovely template. I just found a minor problem. Adding ‘search box’ makes the template splitted into two pieces and makes a gap in between the border of the blog title and the post. I don’t know if I’m the only one having this problem. Did you managed to get the blog title right using the method I suggested above? However, it would be easier if you went into a little more details for the people like me who is unfamiliar with codes and feels scared of changing them. BTW, is there any solution for adding ‘search box’ problem I mentioned earlier? Awesome theme, I’ve just put it on my blog. I’m sure I’m not in the minority by any means, but I do intend to improve. I suppose my main problem is that I find large numbers of comments overwhelming, I can honestly say that I’ve skipped reading entries at friends’ blogs, just because there’s already ninety comments on it, and I a) don’t want to get lost in the shuffle, or worse b) don’t want to be obligated to spew out forty comments of my own. Is there any problem in your site? My background disappeared and changed into dark gray. things went pretty ok with this template except mine ones has header & content) for previous posting went messing around at current posting. how u segregate between posting? after i post my blog….the date will not appear after the title, only the time will appear..how to display all the date..? I love this template, thanks a lot for this template.. I just put this template on my blog and I have 2 formatting issues that I am hoping to adjust. 1.) In the archive widget on blogger, Blogger already puts arrows next to the year/month etc. This template also puts + at the beginning and end of the year/month/post titles. I would like to get rid of these and just have the blogger arrows. 2.) On my posts it puts the time & Author of the post right under the title, and then puts a dividing bar between the title and post. I would like to change it to where the DATE and author appear AFTER the post. It would also be nice if the bar that seperates the title and post would instead appear after the post to seperate the posts better. Right now it looks like the title is appearing with the previous post. It looks weird. How do you put it on your blog? As you can see the title of my blog is at the bottom and I’m unable to Title my blog correctly. Also there is no search box. Love the template, but it just doesn’t seem to work. Sigh. i managed to change the title from the demo=outdoorsy. however, i want to add a sub-header on my title. how can i do it? however, the result was that the will be placed on top of .